The world of Elizabeth McCracken’s fiction is an engaging one. Her narratives come at the reader slantways, helter-skelter, and filled with eccentrics who deem themselves normal or normal people who think themselves strange. Coincidence is frequent and causality oblique. It’s as though Charles Dickens partnered with Anne Tyler to produce a story that’s half-melodrama, half-burlesque, and entirely original. 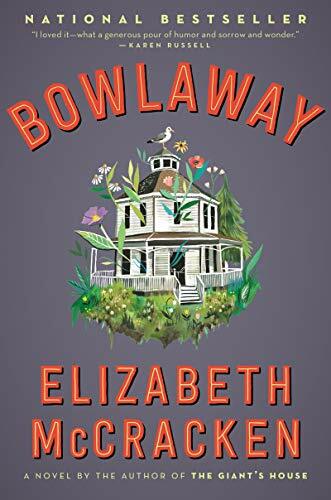 In Bowlaway, to start with, the author declares, “Our subject is love,” and by tale’s close delivers on that promise. We are often far from shore yet never quite unmoored. Bowlaway tracks several sets of proprietors—some willing, some unwilling—of a bowling alley built for candlesticks: a smaller and trickier variety of the modern ten-pin game. The player gets three balls, not two, per frame; the pins must be—or needed to be, at the time of this telling—hand-set. We learn much about the lore and history of bowling, much about its sorrows and acquired skills. This is what’s often labeled a “multi-generational saga.” Taking place largely in the fictive town of Salford, north of Boston, the story covers roughly 60 years; Joe Wear is young at tale’s start and eighty at its end. He plays a major role at the book’s beginning, then drops from sight and (Spoiler alert!) returns obligingly in the final scene. In McCracken’s world such things do happen; what was lost or abandoned gets found. First named “Truitt’s”—after its original impresario, Bertha Truitt, whom we meet lying alive in a graveyard—the alley hosts a series of dramatic encounters. These include the death by fire of her grieving husband, Doctor, Leviticus Sprague, and the murder by bowling ball of her drunken successor, Arch. Nahum Truitt, LuEtta Mood, Jeptha Arrison and Margaret Vanetten each have tales to tell. There’s a “ghoster” and the “Salford Devil”—a shape-shifting menace who threatens the small town. As these several names suggest, there’s something more than a little “arch” about McCracken’s nomenclature; and her chapter titles are composed in the same vein. “The Oddity,” “Betrothed and Beholden,” and “The Unrelenting Baby” are only a few of the headings, and some of the action strains credulity. Death by drowning in a downpour of molasses, or by spontaneous combustion requires, of the reader, a willing suspension of disbelief. It’s a prerequisite, nearly, of the pleasure Bowlaway provides. This sort of surface-skitter through history and fiction is one of McCracken’s trademark strategies. The First World War, the Great Depression, and incremental prosperity provide the backdrop here, and the changing feel of time and place is deftly handled throughout. The novel does have central figures, but it’s an ensemble piece, and each reader will no doubt have their local favorites. At times the language can grow strained. “‘I mean quite the opposite,’ said Bertha. “I mean the natural and exhausting teeming world.” Or, “Margaret looked at her son. He was pale and freckled and red-headed and looked like nobody she’d ever seen before in her life.” Would a character describe the world as “natural and exhausting teeming,” and would a mother think she’d never before seen her son? Like the names of characters, these perceptions can feel forced. The reader won’t be. There’s neatness to the plot’s loose ends and a wholly satisfying if unexpected conclusion. As McCracken declares, early on, “Bowling gave you something to think about besides your regrets.” There’s much to think about here. Nicholas Delbanco is the Robert Frost Distinguished University Professor Emeritus of English at the University of Michigan. His most recent work of nonfiction is Curiouser and Curiouser: Essays, his new novel, It Is Enough, will appear this fall.